With the full title of 'What Does This Look Like In The Classroom? Bridging The Gap Between Research And Practice', this book pretty much does what it says on the tin. 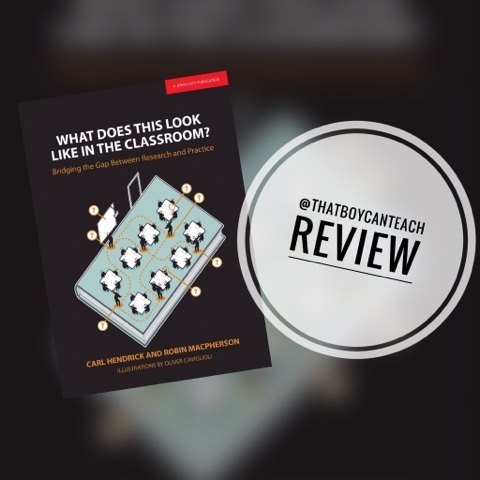 Hendrick and Macpherson have harnessed the voices of some of education's leading lights in order to answer questions about classroom practice from real teachers. The book's chapters each focus on a particular aspect of teaching: two specialists are assigned per chapter to share their wisdom, according to their expertise. With Assessment, Marking and Feedback, Behaviour, Reading and Literacy, SEN, Motivation, Memory and Recall, Classroom Talk and Questioning, Learning Myths, Technology and Independent Learning all covered, this is a fairly comprehensive overview of education. Of course, there are questions and answers not given in the book, but often the commentators give good starting points for teachers to seek out further reading. The added focus on the potential of research-informed practice to improve workload provides further reason for this book to be read. The book's crowning strong point is that it is incredibly readable. The format makes for bite-size chunks and all the contributors are gifted communicators. There are one or two bits of jargon (particularly relating to cognitive science) that might have benefited from the provision of a glossary but this doesn't at all detract from the overall accessibility of the book. It is probably best read as a whole so that the contents are familiar in a time of need - it is the sort of book that should be constantly referred back to. Having said this, it is organised well enough to be dipped into as and when is needed. My one criticism of the book is that much of what is presented as research isn't backed up with any references as to who did the research, when it was done, under what circumstances, and so on. This leaves the reader to trust that the authors either have conducted the research themselves, or have internalised the findings of other research. Having said this, the book is aimed at teachers so it necessarily leans towards classroom practice rather than the intricacies of the research. I would go so far as to say that 'What Does This Look Like In The Classroom?' is an essential volume for a school's CPD library - it could be the gateway to developing research-based practice for some teachers, so accessible does it make the material. It will confirm some of your teaching practices and give you an understanding of why things that you do already work, and it will challenge other practices, but in the least confrontational way possible - this is because it never belittles or devalues teacher experience and expertise. Even if every teacher doesn't read this, if a school's research lead and other leaders do, there is a good chance that classrooms will begin to reflect more of what research outlines as best bets.